Convoluted air springs have various areas of utilization like lift-axle air springs or industrial applications. 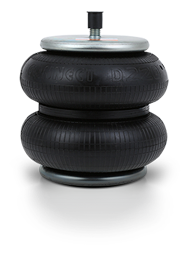 Convoluted air springs are generally used for lifting axles and preserve the tires when the vehicle is empty. Aside from that, they are also utilized in industrial applications as pneumatic lift cylinders or suspension elements to absorb vibrations. These air springs are easy to mount and they last long.